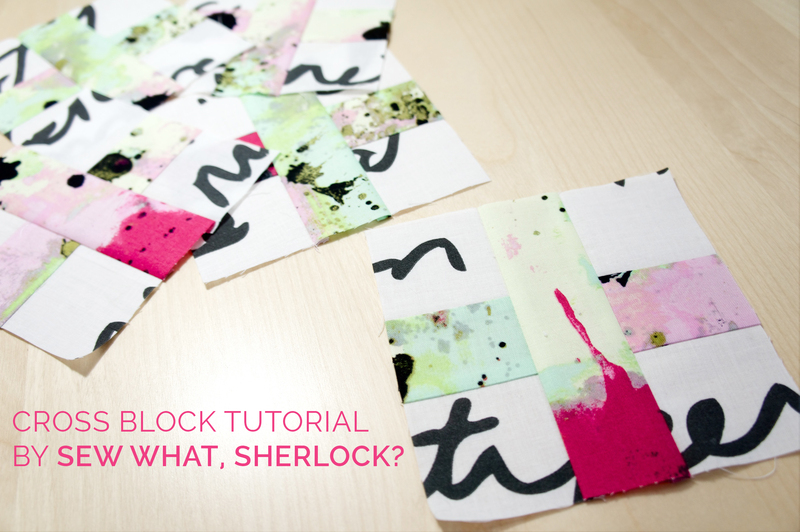 Tutorial: Cross Block - Sew What, Sherlock? 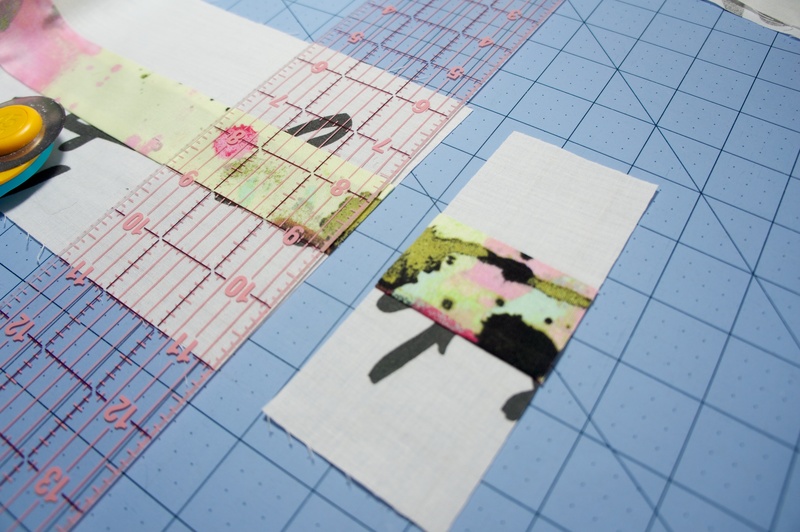 Each block finishes at 5.5″, including seam allowance. Perfect for charm pack mixers! Did you see where I was all funny there about fabric requirements? Well the truth is, you need a bit of the lighter fabric, and then a bit more of the darker fabric. If you look at the block there are 9 sections, just like a 9 patch, so if we assume you’re cutting all your strips the same length, you need 4 white strips and 5 dark strips. Get it? I just eyeballed it, since technically who knows how many blocks you’re making! Anyway, ok here’s the special part. I love math. Seriously. No really, I’m not joking, I love it. You need to cut your white strips at 2.25″, and your dark strips at 2″. Anything that is or contains a white strip gets cut at 2.25″, and anything that is just a dark strip on its own gets cut at 2″. Them there’s tha rules. Just as it says. 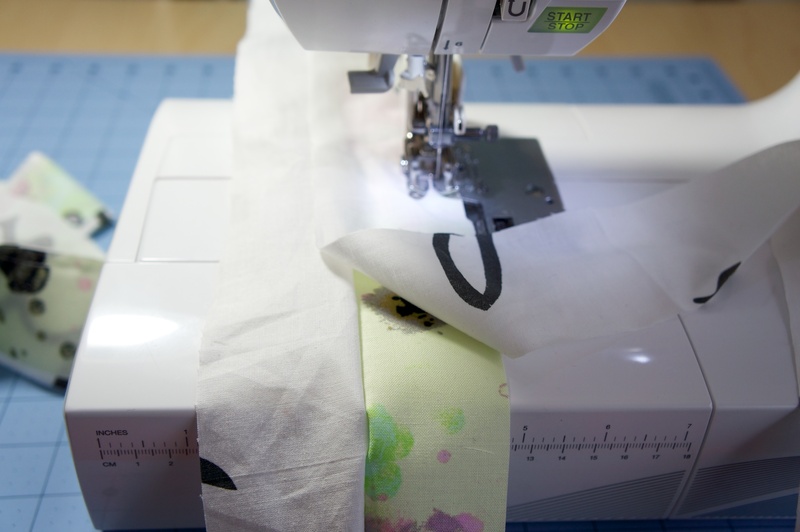 Sew the long edge of one white strip to the long edge of one dark strip, right sides together with a 1/4″ seam allowance. 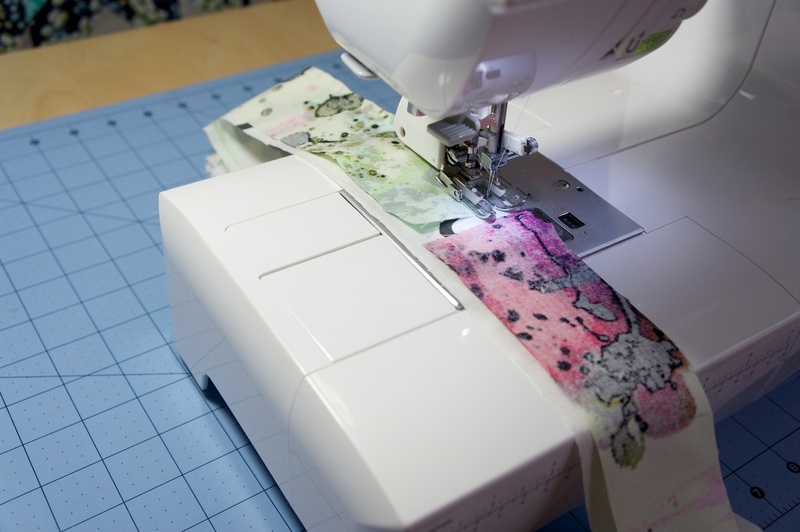 If you’re using scrap bits like I did just go ahead and lay a new piece on top when you run out of one fabric before the other. Just look at the picture, I’m not so good with the words. Next sew another white strip on the other side of the dark strip, like so. I just lifted up the light strip so you could see what’s going on a little better. Step 3: Iron iron iron! Don’t forget to iron on the back and the front! I love IKEA. Step 4: Cut cut cut! 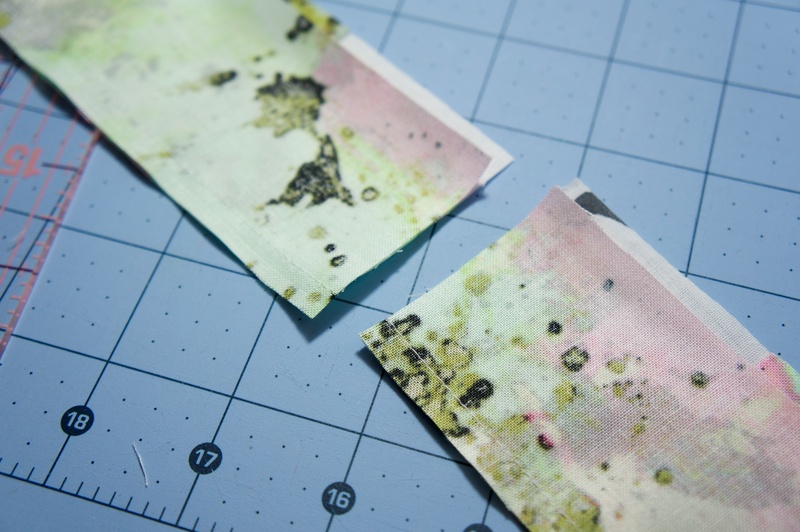 Cut each strip down in to 2.25″ strips. Remember the rule, if it has white in it cut it to 2.25″! 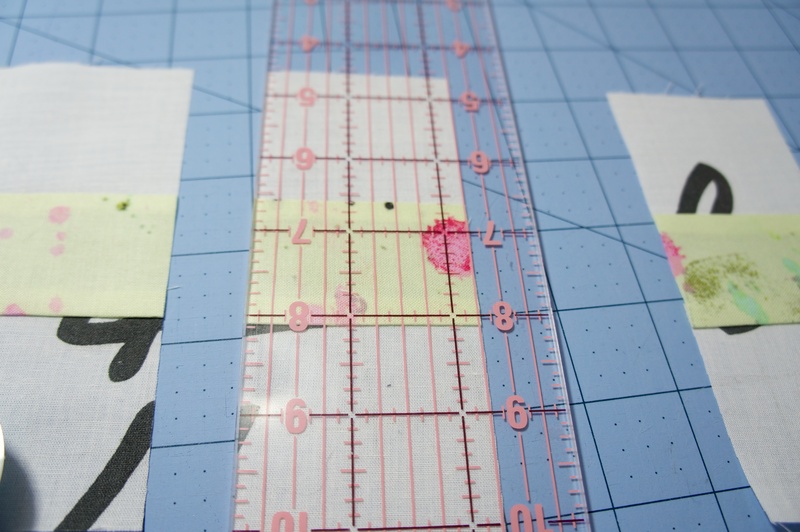 Every time you cut, you should use the horizontal lines on your ruler to make sure the center dark strip is perfectly perpendicular to your cut. 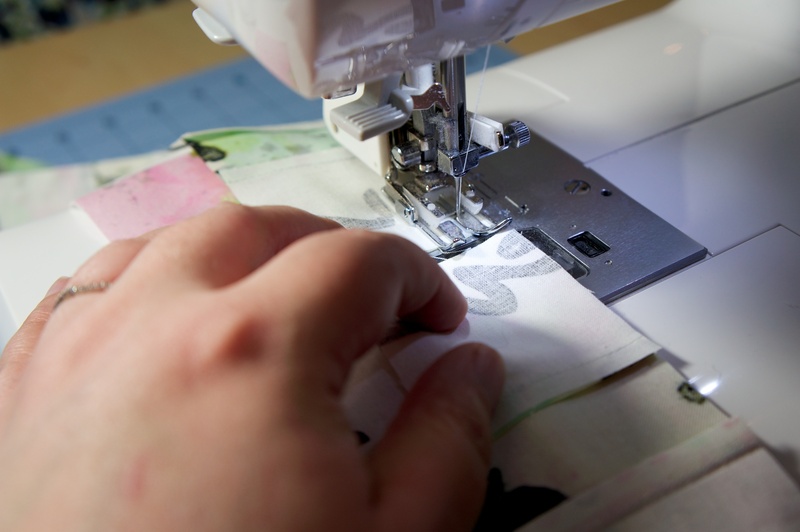 No one’s perfect, sometimes the sewing goes a little wobbly! That’s ok, if your previous cut isn’t perpendicular to the new center, just trim it a bit. No one will know, I promise. See below. I would trim that bit off. 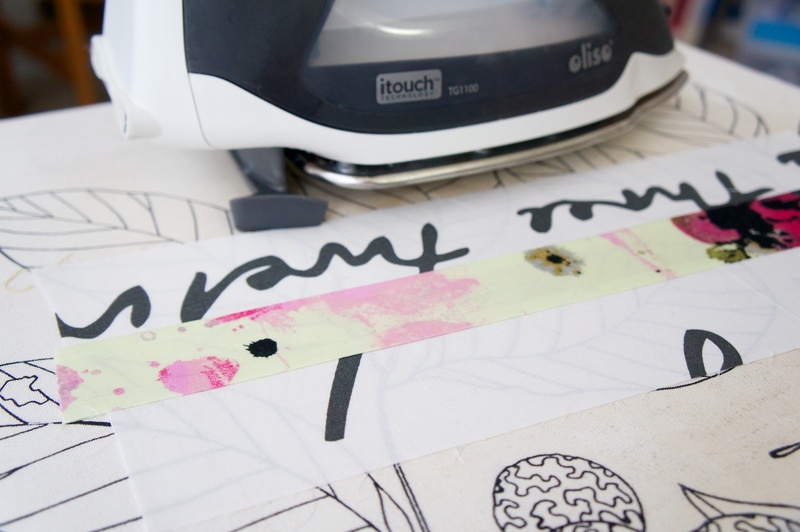 Now you should have a happy stack of cut strips! Step 5: Sew to center strips. Are you noticing a theme here? Lots of strips. Hopefully you can see what’s going on in the picture. Basically lay one long dark strip down, face up, and start laying your newly cut pieces on top, right sides together. 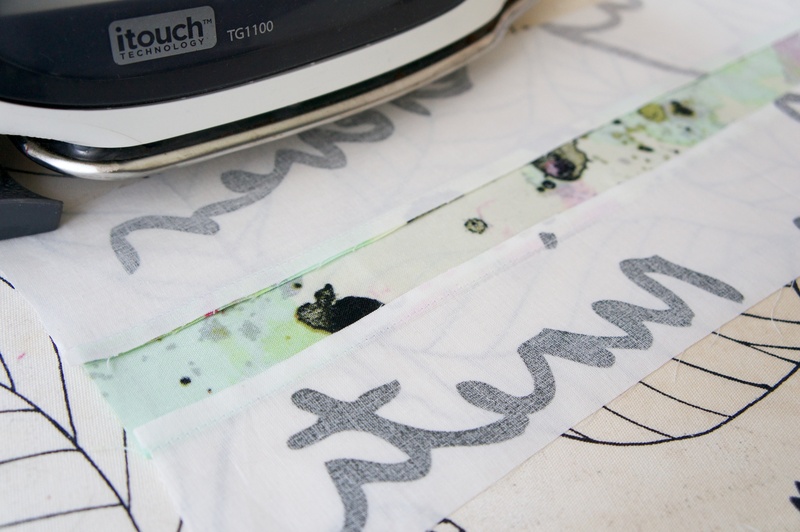 Sew along the long edge, and keep adding the cut pieces as you go, all the way to the end of the dark strip. Make sure you lay down each new cut strip butted right up against the edge of the last one, but not overlapping. This way we don’t have to do any trimming later. Lazy sewing win! 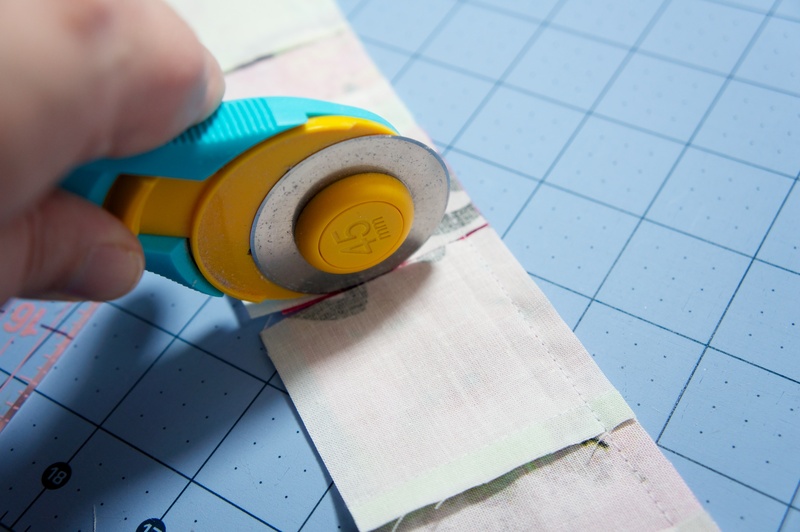 Run your rotary blade right down the space between each tri-cut strip. See? Because we placed those strips right next to each other we can just cut right up between them and we don’t have to re-trim later! Woot! Step 7: Sew the other side of the cross onto the center strip. For some reason I had a really hard time taking this picture. Basically you’re just opening up all your 2/3 done cross blocks and sewing the last tri-cut strip onto the long edge of the center dark strip. You can chain piece them, another lazy sewing win! Chain piecing is really easy. See, as long as the threads in the machine are attached to something they won’t get all tangled in the machine, so you can let one piece run through the machine and out the back, then stick the next one in front of the needle, making one big long chain. My poor picture above shows me sewing the last of one piece and starting the next. 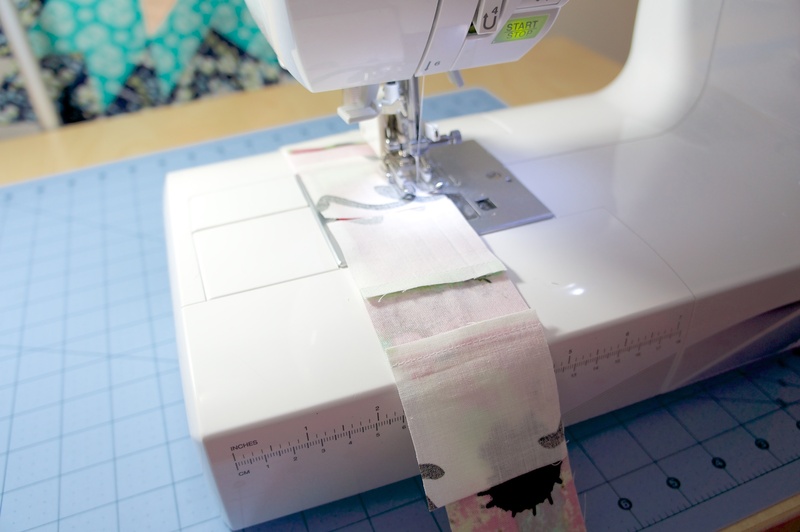 You don’t want to sew the last tri-cut strips on with the previous long strip of sewing uncut because you’ll have a hard time lining up the sides. Trust me. Step 8: Break the chain. This one’s easy. 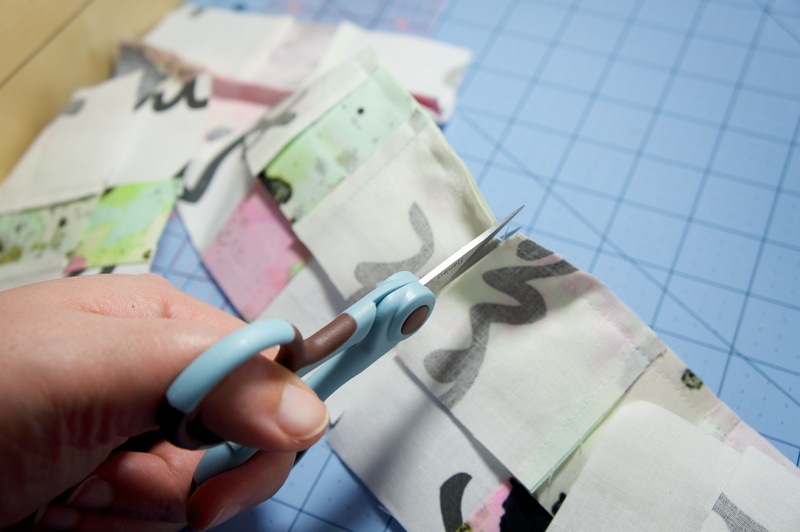 Use some small scissors to cut the connecting threads between each block. Look, here’s a bunch of happy cross blocks all freshly sewn! Step 9: Iron and admire! Iron each block’s seams to the center and hang on your design wall to stare at in wonder and awe. They were so easy, fast, and addicting, you’re going to go make more now! It’s true, don’t fight it. Got a question? Write a comment below. I love comments and I reply to all questions! Make sure you subscribe to replies if you want an email notification that I’ve responded. Conversion Project: Castle Wall Pattern PDF Now Available! Love it! Great fabrics too. That is the best use of that Ikea fabric I’ve seen yet! I also love how you used IKEA fabric. 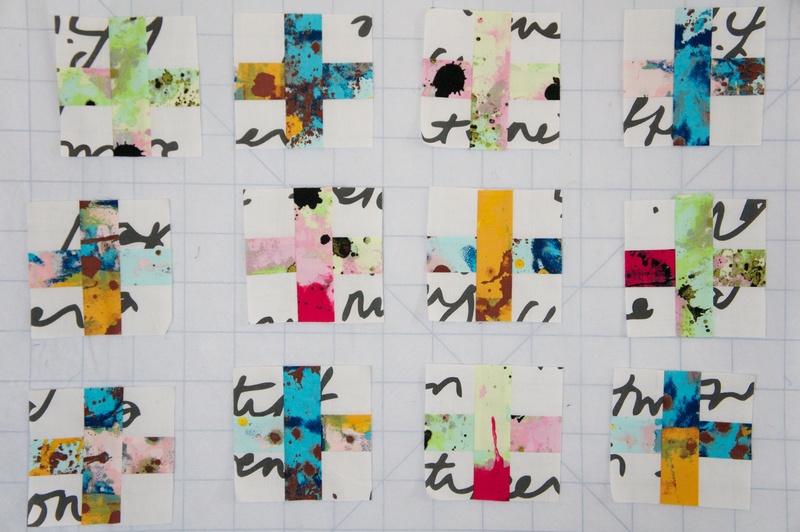 I shared your post with my readers over at Craft Gossip, http://quilting.craftgossip.com/tutorial-modern-cross-block/2014/02/22/. 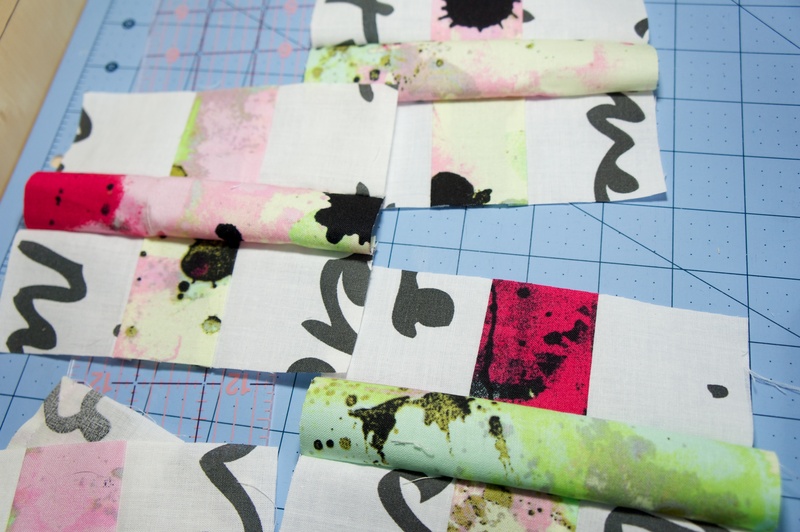 The top is going to be fabulous – keep the white space – when you get it sewn up. Thanks so much for posting it Scarlett!! I absolutely plan to put more of the IKEA fabric in as sashing, that’s why I’ve got them spaced out on the design wall in the pictures. Just need to decide how big I want to make it! Ooh what are those bright splotchy fabrics you used? This will look like modern art when finished! The lighter fabric is called nummer from IKEA and the darker fabric is from Jay McCarroll’s Habitat line. Thanks! !